Purchases made by passive investors are starting to significantly affect the stock prices. At the same time, their purchases are not affecting the financial health of companies, their value or anything else. Index Fund buys shares according to their capitalization, no other criterion (except smart beta and alpha seeking funds) is applied. The more people believe in passive investing, the more will be the share price of the largest companies pushed up. One of the main index ETF issuers is company called Vanguard, which holds 18% of the ETF market share. 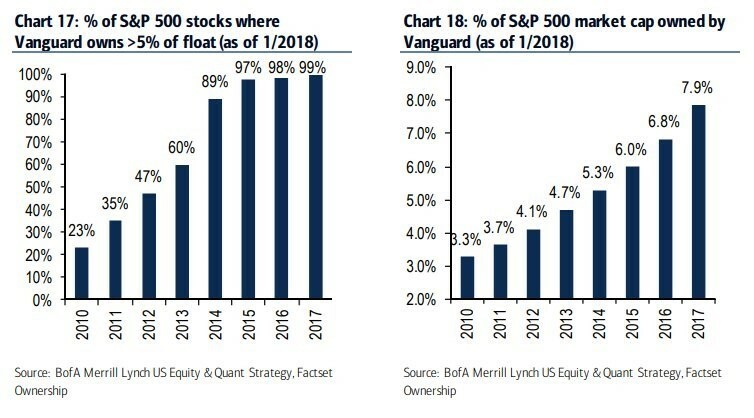 Vanguard holds at least 5% share in 99% companies of the S & P 500 index, 5 years ago it held such a package in only 60% of the companies. Now de facto in all of them. In addition, they totally hold 7.9% of the capitalization of this index. Five years ago, it was 4.7%. Passive investors´ purchases are starting to significantly affect stock prices. At the same time, their purchases are not affecting financial health of companies, their value or anything else. Index Fund buys shares according to their capitalization, no other criterion is applied. The more people believe in passive investing, the more are pushed the shares of the largest companies up. Active investors should therefore thank the passive investors – their behavior increases the number of interesting investment opportunities. The second factor is the fact that most passive investors do not actually stay passive. They are not prepared psychically on passive investment, otherwise the average time of possession of passive ETFs could not be just 1.5 years. This is not an investment, but a medium-term speculation on the development of the market. I have a friend who claimed to invest for children with a horizon of 15 years, but he behaved almost like a day trader – he checked the prices on daily bases. He also watched economic reports of all kinds, almost daily asking me what I think about that or that report. From my point of view as a long-term investor, this was an irrelevant message, but I was unable to explain it to him. During the first correction after a few months he sold the fund. This type of investor influences the financial markets more than they admit. They buy at the top and sell at the bottom. The yield of passive investors is therefore much under the yield of indices that attract them to passive investing. This behavior further improves the position of knowledgeable active investors. In addition, the less active investors is on the market, the smaller is the competition.